Made from 100-percent authentic and premium Turkish cotton, this excellent towel cover is designed to fit neatly over standard size chaise lounge chairs. The crisp white finish features a custom monogrammed letter atop the plush terry-cotton weave, lending character to the charming look, while built-in pockets hang at the side for storing cell phones, magazines, sunblock, and more. 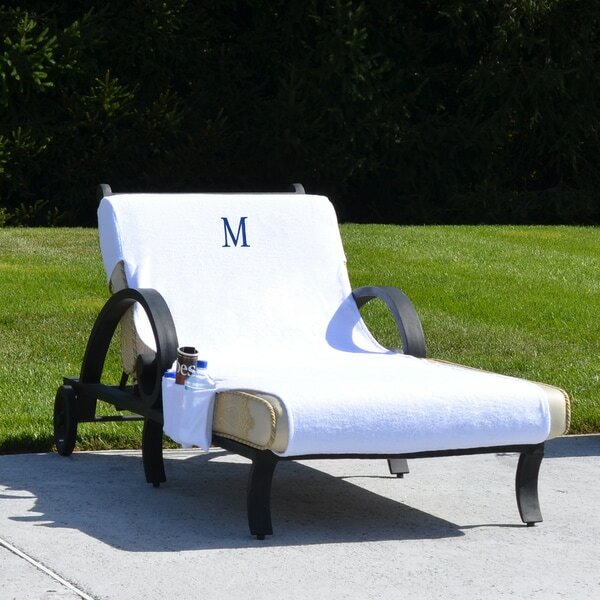 Monogram adds a nice touch, keeps the lounge chair cool and soft. Pockets are very nice to store, cell phone, glasses, suntan lotion, etc. Over-sized so fits on most lounge chairs. These Turkish monogrammed towel covers are great for lounging at home or at the beach. I love how soft they are and they wash easily. The monogram gives it a distinct, Personal and classy look. Love the side pocket, too ! This is a wonderful towel for the water and sun lover! Cotton is so comfortable and the towel is well made. Love the pockets for cell phones, sunglasses and a book. This fitted ends are perfect for windy days so your towel stays in place. Highly recommend this towel! These lounge chairs are beautiful to look at - very classy look. The comfort level on them is just out of this world. The head part is adjustable to sit up or lay all the way down. You must order the "initial" towels that cover them - added look of class for sure! We did and I love them! Got many compliments on the set plus the added table that comes with it. Def worth the price! These lounge covers added some elegance around the pool. The pockets are big enough for your lotions, phone and magazine. Once you finished by the pool for the day, if a wash is required, they come clean with a without any pretreatments. Beautiful Lounge Chair Covers - I bought 4 of them and all of the monograms were correct! Great quality and the perfect gifts! This is soft and luxurious and fits nicely on my Chaise Lounge. It was delivered on time as well, I would highly recommend this item! Love these towels oversized perfect for your poolside lounge chair. The price I paid vs to the quality I get..... will not recommend! I was surprised other reviewer said was great quality.. the towel is kind of thin and not soft at all in my opinion ... like you go to dollars store to purchase the towel there!! Would most definitely recommend to friends and anyone reading this. Great fabric and feel. My monogrammed towel gives off the air of a luxurious hotel experience...just what I was looking for. I feel like a diva, lying next to the pool with my personal towel. Yellowed after one use and would not come out. Also pulled easily. Overall did not wear well. Would not purchase again. Love these towels and need many more!!! Way too oversized and the sun turned them yellow within a month. "What color is the monogram. Navy or black?" I chose the color Navy. "Where could I find the lounge chair the towel is on?" I don't know where to find this specific chair but I just used my towel while on vacation and it fits any standard lounge chair! I got so many compliments on it! Donna G.